Skin and Beyond Irvine, is proud to present their newest addition, Platelet Rich Plasma Therapy (PRP)! SAGGING SKIN ON THE FACE AND AROUND THE EYES. The results? A refreshed, natural-looking glow that takes years off your appearance! CELEBRITIES LIKE KIM KARDASHIAN HAVE ADMITTED PRP IS ONE OF THEIR SECRET WEAPONS TO FLAWLESS SKIN! The Vampire Facial at Skin and Beyond Irvine uses your own blood to prepare a PRP mixture that will be applied to your skin. The collagen-rich treatment will help firm, tighten, restore, and rebuild your skin to its youthful glow. The Vampire Facial is non-invasive, and uses tiny injections similar to those used in Botox and dermal fillers. From start to finish, your procedure should take about 30 minutes. 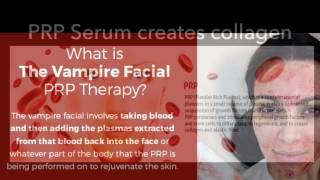 Anyone who wants to look younger and feel more confident is a great candidate for a Vampire Facial using PRP therapy. Your Procedure Results are only as good as Your Technician Skin and Beyond in Irvine is a respected, professional, and dedicated Skincare establishment that specializes in Microneedling, Botox, Juvederm, IPL Photofacials, and Laser Hair Removal Treatments. These treatments are proven, safe and effective. We have been providing quality care for 35 years helping women and men reach their full potentials. We utilize the latest techniques, which involve minimal downtime to zero downtime. • Our entire team is dedicated to the success of your procedure, from consultation to recovery. Is the Vampire Facial Procedure Right for You? PRP Vampire Facial in Irvine, is a Non-surgical procedure that will take your skin to the next level. To schedule a consultation for FREE fill out our form or give us a call at 949.215.3500 Learn more from the video above.